US05, fermented around 60-65, it was a year ago. I started this in October of last year, and then after primary fermentation I racked it to a carboy and added some brett. I think it might have been amalgamation, but it was a year ago so I can't really remember. Danstar ESB, fermented around 68. It stopped at 1.022, so I added some US05 to try to finish it off a little more, but it didn't take. I'm not using this yeast anymore. This should be around 6%, and 30 something IBUs. It's been in the bottle for a few weeks, and is in my unheated garage now around 50 or so to keep it from fermenting further. When you get them, please keep them somewhere cold so the brett doesn't eat the leftovers the ESB didn't want. Its got a nice tan head with really small bubbles that lasted the entire pint. It was well carbed. Aroma: Brett, leathery, smokey with a bit of fruity hop character. After it warmed up quite a bit I also got some hints of sweet tarts. Really enjoying this one. Lots going on in every sip. Agreed with the others, love how the dark/roasted malt plays in with the Brett funk! This was a strange one for me. I was getting a smokey bubblegum on the nose and for the first few sips. Once it warmed up a bit was more of a smokey porter. Very enjoyable. Thanks! Thanks for the brew. I'm not getting the Brett coming through much I'm getting more of a fruity porter thing. I'm enjoying how its changing as it warms. Nice beer, lots going on and it changes as it sits in the glass. I find the brett is prominent in aroma when you first pour. Then the roast aroma punches through. Coffee, dark roast malt. After that, it warms up a bit and I get dark cherries on the nose. The flavour is more roasty than bretty, but both are there. I think it's well balanced. The finish is bone dry with some tannic type dryness on the palate. It reminds me of a food wine - I think this beer would go well with hearty stew or a steak. 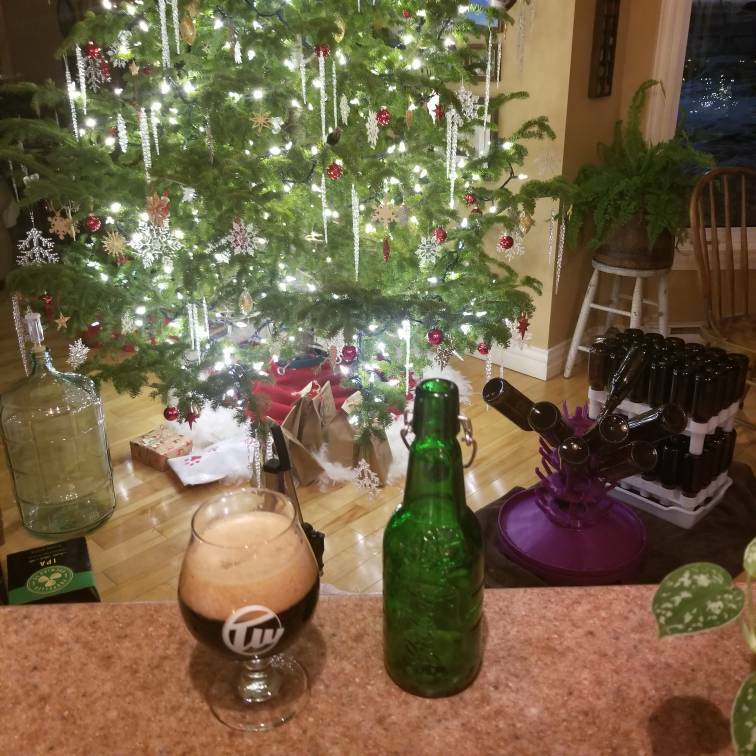 I've had one of Andrew's Brett beer/Porter blends before so I was happy that's what he submitted this year. I don't normally think of Brett and dark beers, but this proves it works nicely when done well. I got a roasty note on the nose along with some funk, and the same on the palate with a touch of sweetness and an interesting acidity. It was hard to drink it slowly enough to let it warm up and see what developed. Another nice entry; thanks! Great funk aroma and flavor coming through. Gives a barrel aged feel. I get under ripe plums and the soft smokiness with the roast malt. Complex and delicious. Thanks for sharing Andrew. I thought this was a lovely and complex beer. I really appreciate how well the blend was done, nothing overpowers and it makes for something really unique. The beers have been very impressive so far! Really enjoyed this beer, I love stouts and appreciate the different take on it. Thanks for sharing and keep them coming. Not much new to add. I didn't get the same degree of brett funk everyone else seemed to note. Probably not as noticeable due to the stout roasty-ness? Regardless, it was a great beer. Thanks. I liked this beer. Not 100% convinced you need Brett in a beer with roast barley and black malt. But here it is. This must be something Andrew has been working on because it walks a fine line between metallic and dry while staying tasty and entertaining. Since falling in love with brett, i've wondered how it would come through in a dark beer. The aroma is like dark fruits and chocolate, with some funk. Roast malt flavour plays with fruit and a little sweetness. Any sharpness feels like its coming from the carbonation than from brett. Carbonation was strong and delightfully tingly. I am really enjoying this complex basket of funky chocolate covered Christmas fruits. This was a damn fine beer to have while bottling last night. Nicely carbed, complex, and well-balanced. A real treat. Thanks! Thick head with small even bubbles and great retention. Roast and chocolate lead with leather and berries from the Brett rounding out. A really cool idea with delicious results. Thank you!